This indicator shows the annual number of pollution incidences at sea in Slovenia which were reported to the Office for the Protection of Coastal Waters according to the identified polluter and type of pollutant (oil or other). One of the fundamental objectives is the improvement of prevention and intervention action plans for cases of sea accidents resulting in pollution. For this reason, it is necessary to ensure efficient equipment and, if requisite, upgrade cooperation with the neighbouring maritime countries. This is provided for by the International Maritime Organisation (IMO) and conventions concerning marine protection against pollution, safety in maritime transport, prevention of pollution from ships (International Convention for the Prevention of Pollution from Ships as amended by the Protocol relating thereto (MARPOL 73/78)), readiness and responsiveness in cases of pollution, as well as responsibility and amount of compensation for the damage resulting from pollution. The Protocol Concerning Cooperation in Combating Pollution of the Mediterranean Sea by Dumping from Ships and in Cases of Emergency is currently under the ratification procedure. The International Convention on Readiness, Response and Cooperation in Cases of Oil Spills 1990 (OJ RS – International Agreements, No 9/01) is already ratified. Since June 2003, the control of navigation under the mandatory ship reporting system and the vigilance service at the competent Maritime Directorate of the Republic of Slovenia are being implemented which attests to successful integration of environmental protection into sector policies. 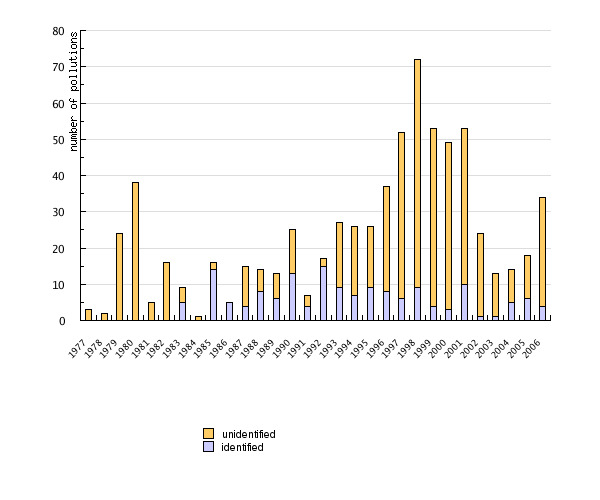 Figure MR1-1 shows that in the period from 1977 to 2006, the Office for the Protection of Coastal Waters (OPCW) acted in 708 cases, of which 322 were pollutions by oil. Polluters were identified in 156 cases, while in 552 cases the polluters remained unidentified. It is evident from the graphic representation that a slight increase in the number of reported pollutions occurred in the period from 1992 to 2002, which fact is difficult to comment upon due to the insufficient database. Greater awareness of people reporting such incidences and most likely the increase in the number of registered smaller boats intended for recreation (approximately 9000 registered boats in Slovenia) also partly contributed to this fact. Irrespective of the quality of the existing data source it may be assumed that illegal discharges of smaller quantities of oil (oil derivatives which are not readily degradable) into the sea are predominant in Slovenia. Taking into account the total number of noted and reported incidences we may assume that these pollutions, according to all the characteristics of our sea (semi-closed, shallow bay, relatively small volume, great impact of climate factors and poor exchange of water mass ...), have considerable negative effects on marine environment, in particular in comparison with open seas. This fact dictates the need for the establishment of a system for detection and thereby the forming of an appropriate database for the following-up of related indicators from the area of transport whose target is to eliminate pollutions by non-readily degradable oils and prohibit their discharge. Namely, in addition to shipping, boats contribute an important share of smaller, illegal spills of oil into the marine environment, predominantly in the summer-time period. The indicated data and facts, as regards actual cases of spills below the detection limit of the EU standard by no means attest to the fact that pollution by spills exceeding 7 tons is not possible in Slovenia or in the immediate vicinity of the Slovenian sea. Namely, the north Adriatic sea is becoming, globally speaking, one of the most important waterways for oil and its derivatives and other more or less hazardous substances. This also represents a high risk for our sea, i.e. in view of the potential greater sudden oil or oil derivative spills. Should greater quantities of oil or oil derivatives spill into our sea we would witness a rapid spread of pollution to crucial parts of the sea and coast-line i.e. upon momentarily inadequate equipment of the OPCW. Due to the closed nature and shallow waters of our sea as well as geomorphological diversity of the coast-line, the cleaning and remedying of consequences of pollution in the aforementioned areas would constitute a very difficult task and the economic and ecological damage to the sea and the coast would be enormous. Concerning events of major spills, interstate activities (in Slovenia, Italy, and Croatia) for implementation of the Agreement on the Sub-regional Contingency Plan for Prevention of, Preparedness for and Response to Major Marine Pollution Incidents in the Adriatic Sea, which was signed on November 2005 in Portorož at the 14th Ordinary Meeting of the Contracting Parties to the Convention of the Protection of the Marine Environment and the Costal Region of the Mediterranean or Barcelona Convention. The data are taken from the Tabular review of pollutions taken from monthly reports on the work of the Office for the Protection of Coastal Waters (OPCW), Koper. The collection of data was carried out in the event of individual incidences with a view to keep an internal record for the needs of the OPCW. According to the aforestated, the existing data are insufficient and can serve only for orientation. Irrespective of the fact that the data do not contain weighted quantities (tons, m2 ...) for individual incidents it may be deduced from individual reports that so far there have been no incidences resulting in spills exceeding the quantity of 7 tons of oil. Despite great shortcomings the data clearly show the number of incidences by years, the number of oil pollutions and other, as well as identified or unidentified polluters. Under the indicator methodology, as shown by the European Environment Agency (Indicator Fact Sheet – 41a: Accidental oil tanker spills), Slovenia is below the detection limit as regards sea pollution resulting from accidental oil tanker spills exceeding the quantity of 7 tons, for which reason international comparability for this indicator is presently not relevant.